Open boat per person trips available. Call for openings. Our goal is to provide an extremely safe and fun day for our customers. Our captains and mates are very courteous, friendly, safe and very fishy. If you have ever had a bad experience on other charter boats before you are in for a treat with us because the only jerk you are going to find on board is going to be on the end of one of our rods. Harwich Port offers some of best fishing in the world. We fish Nantucket Sound, in the tide rips of Nantucket Shoals and Monomoy Shoals, and further east and south for tuna and sharks. 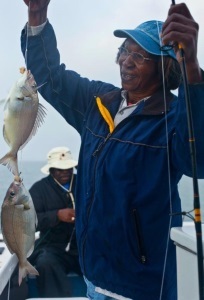 Our mates and captains are happy to fillet your catch. 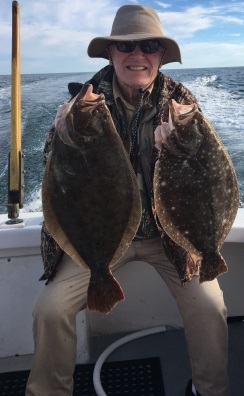 Spring: Nantucket Sound offers outstanding spring fishing starting with squid in April-May. 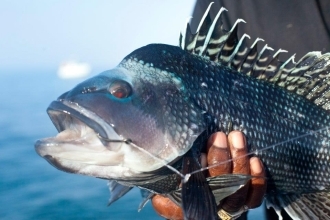 Starting in May is world class Scup/Porgy fishing off Hyannis, Dennis and Harwich. 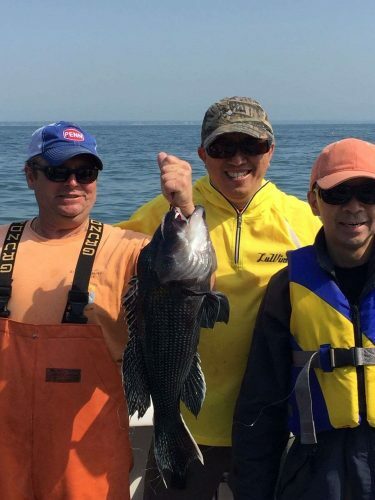 May also brings the Black Sea Bass and Striped Bass to the Sound. Book a May trip with us and it is not uncommon to go home with a nice catch of all three species. Summer: June kicks off Summer fishing. The Striped Bass, Blue Fish and Fluke move to the Shoals of Nantucket, then Monomoy. 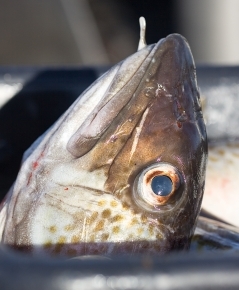 There is Red Hot Action in June because of the wide variety of bait: sand eels, squid, butter fish, scup, and herring. At this time of year there are Tons and Tons of Bass and Blues hungry from their northerly migration. 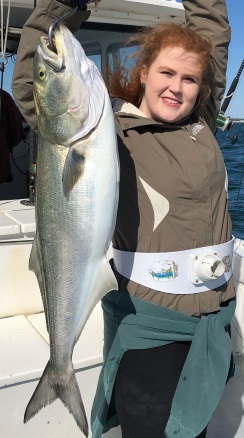 June has some of our best Bass and Blue action and we continue fishing the shoals from June through October for Bass, Blues and Fluke with excellent results. 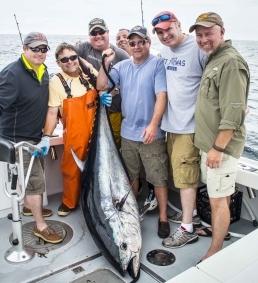 Tuna and Sharks: June also brings with it the Bluefin Tuna east of Cape Cod. 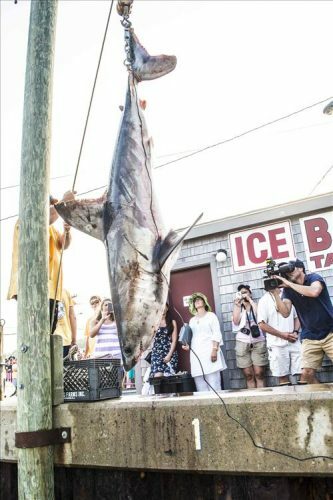 Sharks – Blues, Makos and Threshers – are found in great numbers south of Nantucket and Martha’s Vineyard. 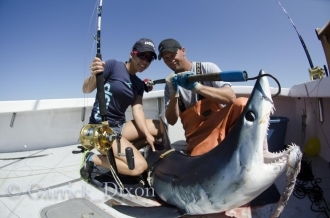 We recommend you book your Tuna and Shark trips late June through October. Our charters specialize in Bluefin Tuna running from 50 pounds to 200 pounds. As the summer progresses the giants show up and we have caught them up to 850 pounds in the fall – September-October. Canyon Fishing: We will run further south in search of the warm water species also; Yellowfin Tuna, long fin Albacore, Marlin, Dolphin/Mahi Mahi and Wahoo have all been caught on aboard the Magellan out of Harwich Port. These trip are done by special request and need to be booked in advance. Overnight canyon trips are also an option. Call Captain Len for these special charters and prices. Fall: September and October are prime Tuna time on Cape Cod. The bulk of the tourists are gone and accommodation rates go down, but the fishing heats up big time. 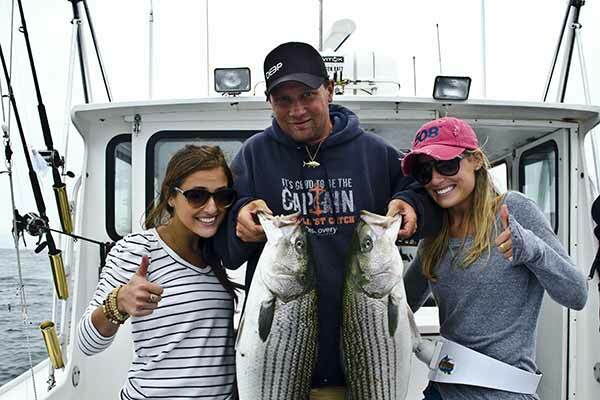 We offer Tuna and Tuna/Striped Bass combo trips throughout the months of Sept-Oct. 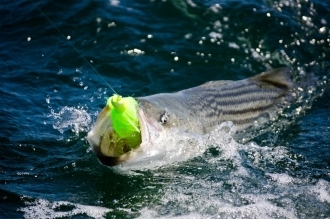 If you just want to catch Stripers they here for the taking through October and we have even had good catches into early November when the last cows make their move south. 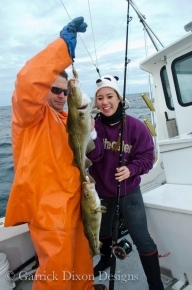 Winter: November through April we offer Cod charters. You may also catch Haddock, Pollock, and an occasional Wolf Fish or Monk Fish on one of these trips.